But try to keep it under 100 mph, ok? Yesterday, Glogirly left for BlogPaws. Salt Lake City or bust. Starting tomorrow, I'll be providing daily BlogPaws updates right here on my blog. The DOGS better watch out. This cat is ready to DISH. UPDATE - Glogirly made it safe and sound to Rapid City, South Dakota. No speeding tickets, no empty gas tanks. A few bugs gave their lives to the windshield. RIP. Flat Katie had some issues in the car though. Glogirly thought it would be cool to have Flat Katie look out the window...just to throw off the other cars. Well it wasn't cool at all. Apparently the extreme heat melted Flat Katie into a potato chip looking thing. FORTUNATELY Glogirly was not far from home so she came back and did a quick repair job to Flat Katie. Only an hour or so was lost. The two are resting comfortably at the Hilton Garden Inn. Now that we are going, we are particularly disappointed that you didn't win the Blog Makeover contest (is that what it was--we entered but were not a finalist) because we read you and would love to have suggestions and compare to our experience of what we really like and just think is okay. Oh well. See you there! 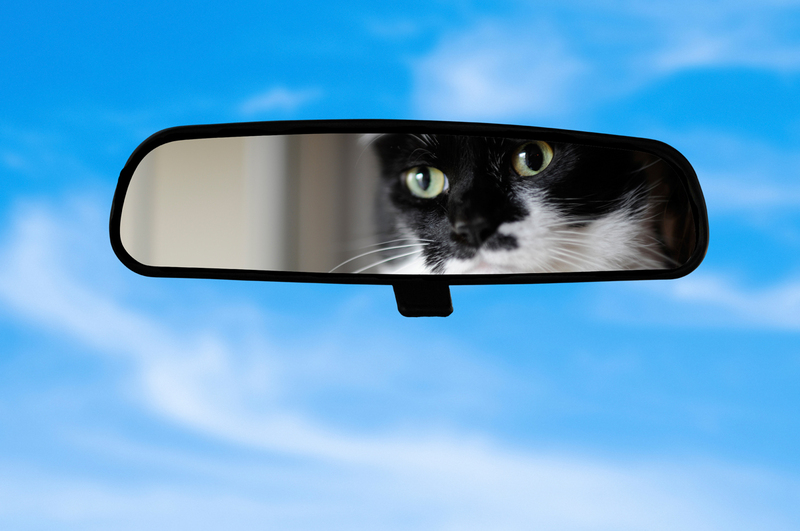 Katie...how could Glogirly keep going with you in the rear view mirror? My human isn't leaving until Thursday. Good thing too, she is totally not ready to leave yet! Did she REALLY need to make repairs or was she just telling you goodbye again? Codspeed, Glogirly. We voted for you in three different categories. We wish you the best of luck. Enjoy your Blogpaws! Take care. Yeay! Now we await eagerly for Blogpaw updates from Glogirly and Flat Katie! Awww...poor flat Katie. Good thing Glogirly was close enough to home to make repairs. Can't wait to meet flat Katie and Glogirly in Salt Lake City. Keep up the good work on the blog! Jeez, we're glad Flat Katie is okay now. Be safe!! Love the rear view mirror...see you soon! Hoping to blog from there too but sometimes my laptop doesn't work with someone else's Wifi....we will see! i hope g.g. isn't partying too hard in rapid city. She melted your flat alter ego? Oh my, that's going to require some therapy sessions - I can just hear you on Dr. Phil - up next, Parents who melted their children. Hahahahahhahaaaah! Hooooooooo! Ahahaha! Sorry, the thought of flat Katie melting paints a funny image. Now Plush CK wouldn't have melted. She rode in the front window all the way down to Virginia & back in a hurricane, no less. Be careful staying in those Motel 6's. TW has plenty experience in those and some of it would curl your hair! M really wishes she were there with you. What a fantastic opportunity to meet all the oomans of our pals. Have a blast! Glad Grogirly arrived safely. I hope she and Flat Katie will have fun! Mommy's snickering at Potato Chip Katie...! We're glad Glogirly and Flat Katie made it safely! Hi Glogirly - just letting you know that Kizzie and I have given you a "One Lovely Blog" Award. See Kizzie's blog for details. If you want to display the image of it, it's on the awards page. Glad Glogirly and Flat Katie arrived safely, except for the little meltdown. We can't wait to hear all about BlogPaws! Ah that is so good the minor crisis of Flat Katie was readily solved so that she and Glogirly can fully enjoy the blogpaws experience. Well at least she fixed your flat! Just thinking of flat Katie looking like a potato chip makes me giggle! Me would loves to sees a picture of yous 2 side by side!